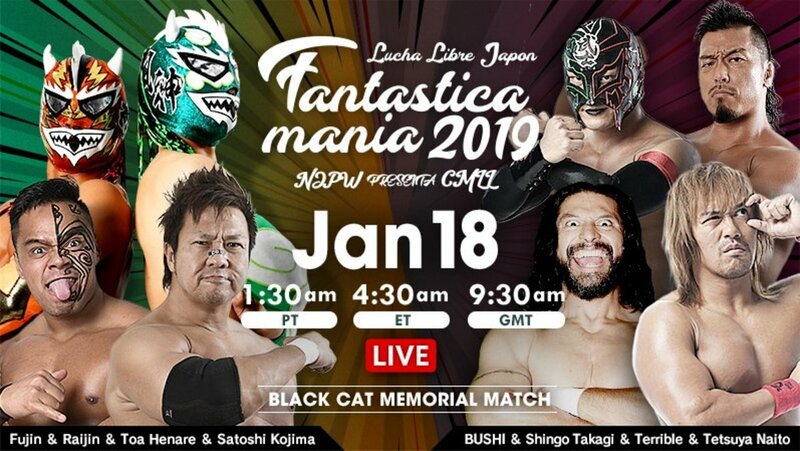 Here are quick results from this morning’s Fantastica Mania event at Korakuen Hall. It featured the finals of this year’s family tag tournament, as well as a special singles match between Soberano Jr. and Barbaro Cavernario. Audaz submitted Templario with the cross arm breaker. Titan picked up the win over Forastero with the titanica. Kojima pinned Terrible following a lariat. This was the annual Black Cat memorial match. - Ultimo Guerrero and Gran Guerrero defeated Atlantis and Atlantis Jr.
Gran Guerrero defeated Atlantis Jr. after hitting a modified sit down powerbomb. Caristico submitted Flyer with la mistica for the win. - Barbaro Cavernario defeated Soberano Jr. In a special singles match, Cavernario scored the win over Soberano following a cavernaria. Dragon Lee pinned Sanson with the desnucadora to win this year’s family tag team tournament. Ultimo and Gran Guerrero confronted Dragon Lee and Mistico after the match.